July 3rd, 2007 : Sunny and Pleasant, Water temp 82* and Clear. Couldn't catch bait early so I picked clients up and went and caught about 140 Herring in 3 throws and also helped a friend put some bait in his tank. Started searching nearby and hit a few schools in 28' of water. We could stay on them for 20 minutes or so and then I would have to find another school which was pretty simple considering how many fish are in the lake now. We hit a half dozen schools and decided to look somewhere different so I motored away from the crowds and located a school a little deeper in the mouth of a creek. We caught our 20th keeper there and before we could get the other 7 rods in they all hooked up. The crew did extremely well to get the fish in the boat and release all of them alive and well. 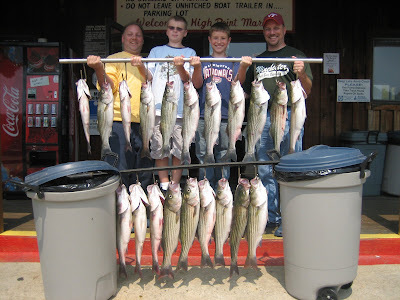 We caught 30 fish this morning with clients keeping 20 nice Stripers to put on the grill for the 4th of July.